The Dark Cat has offed the Bright Bro, and now he plans on taking his babe on down to his pad to crash. They have invited you to fall in and trip down to the Otherworld Circle commune to celebrate death and life. Ya dig it? There will be a children’s festival happening beginning at 4:00 PM, with games and stuff for your little flower child. 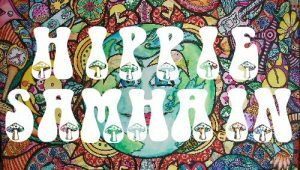 Wear your tie dye, bell bottoms, dashiki, dresses, or anything cool for this Hippie festival. Celebrate with us and bring something to scarf for the potluck feast following ritual. All are invited to attend as long as you are respectful to the land and the people who attend. All items will be passed out to the homeless community directly. PLEASE DO NOT bring your fur children. Furless ones are always welcome at BBC unless otherwise specified. Blackberry Circle rituals are an outside event, and as such there is a possibility that you may come in contact with various critters that range from irritating to plain evil. Also, the land is not concrete smooth by any means and there may be holes, roots, or other impediments out there. Categories: Blackberry Circle, Ritual, Samhain.